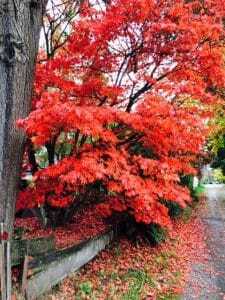 Autumn is a wonderful time to visit Seattle and enjoy the fall colors. Stay at one of the Seattle Bed and Breakfasts to receive help from your innkeeper in planning your scenic trip. Enjoy the Fall colors by car or on foot. Three Wonderful Drives to Take in the Fall Colors. Scenic Drive via Three Mountain Passes – 203-mile loop from Monroe to Leavenworth to Cle Elum to Issaquah. Stevens Pass/Blewett Pass/Snoqualmie Pass loop. Stop in Leavenworth for a nice lunch. Drive and Hike – Chinook Pass and include a 4 mile hike around Tipsoo Lake and Naches Peak on the Eastside of Mount Rainier. Local Drive Including Wineries – Drive from Fall City to Carnation and then on up the Snoqualmie Valley until you reach Monroe is beautiful this time of year. Great wineries to take in along the way. Six Local Parks to Stroll Through and Enjoy the Autumn Colors. Discovery Park – 534 acres with colorful woods, meadows and homes, beaches and a lighthouse. Washington Park Arboretum – Woodland Garden and Japanese Gardens and more Lake Washington Blvd – This drive can be walked after you have driven some of it to preview it. Walk along the lake and enjoy the water, wildlife, and wonderful fall colors. Kubota Garden – 20 acres of American-Japanese Garden with Blazing Fire Red Japanese Maples. Seattle may not be like the Northeast in the amazing colors but for the evergreen state we still have a wonderful fall show of colors. Enjoy!